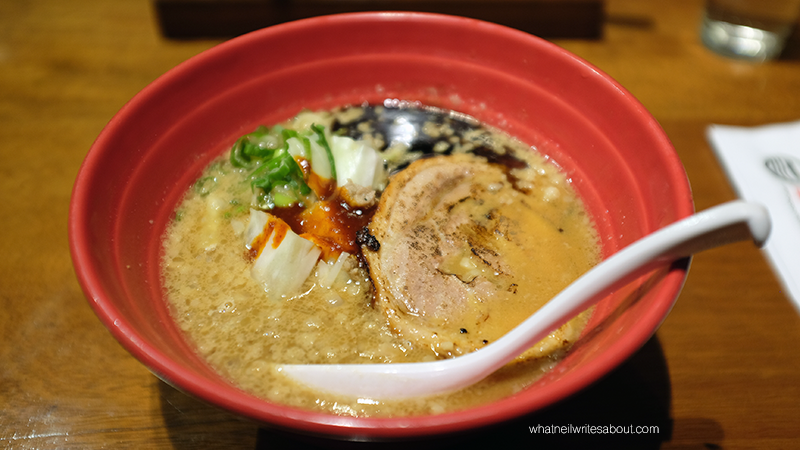 Neil Writes About Ippudo PH's Latest Miso Akamaru Ramen! Last October 2013, me and my siblings were able to visit Tokyo, and we stayed at a Hotel located near the busy Ikebukuro station which is a couple of blocks away from an Ippudo Branch. It was here that I first had my first Ramen in Japan. At that time, Ramen was in its early booming stage in the Philippines and I had only eaten Ramen from Mitsuyado-Seimen near Buendia, Makati and Ukokei Ramen-Ron along Arnaiz, Makati. It was a wonderful experience to see the contrast of Ramen from Japan itself and one from the Philippines. I know, it's summer. It is forecasted to have at least 30+ degrees Celsius. I should be cooling off with something cold like Ice Cream from the Farmacy. Well, you're right, but in Japan, Ramen is eaten everyday even during their warmest climates, and let's be honest, when you crave, you crave like crazy. I assure you that after you read this article you won't regret picking one bowl of Ramen for yourself. 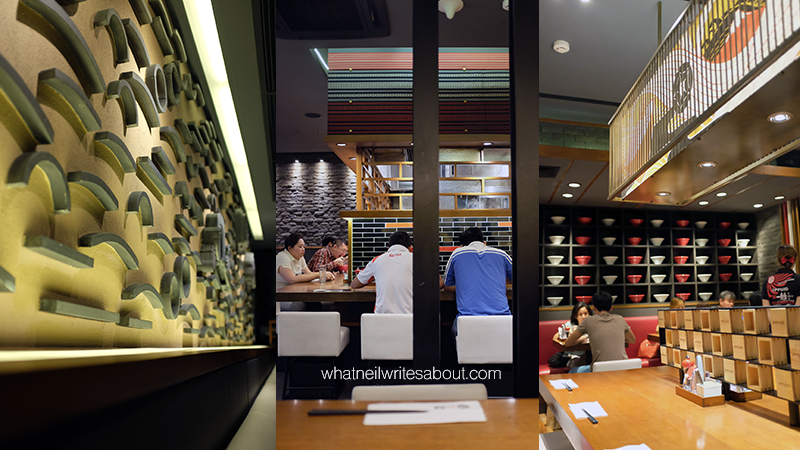 Getting to the only branch of Ippudo Philippines at SM Megamall is pretty straight forward. Drive along EDSA until you Reach Shaw Blvd. You will see Two Massive Malls, the Shangri-La Plaza and the SM Megamall. 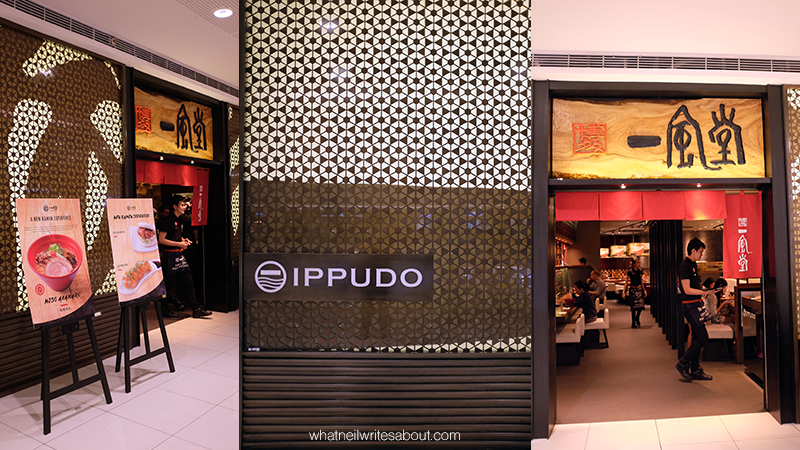 Once you get there you will need to get to the Mega Fashion hall and reach the third floor where you will find yourself a huge atrium and at one end of it is Ippudo Philippines. Bright Golds and Reds with accents of blacks and browns! You will be greeted by bright colors of gold and red with accents of blacks and browns. 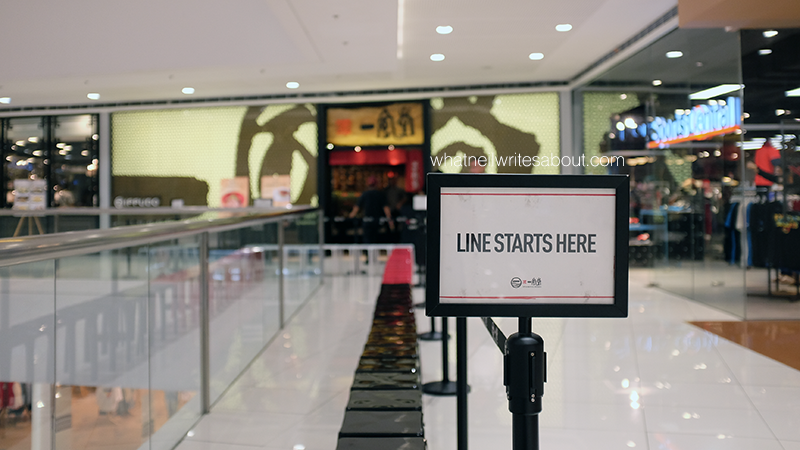 As you get closer, you will see a line of colorful stools with a sign saying 'Line Starts Here.' It isn't much of a surprise, most establishments that are famous in Japan really are lined-up for. Patience is a virtue as they say. You are greeted by this lovely queue of colorful stools! From the outside you could tell that they used high quality materials for the design of the facade. The traditional cloth banner with the signature wooden sign of Ippudo really stands out and makes you feel like going inside a Japanese establishment. Once Inside you notice that the design language they used are a mix of modern and traditional styles. The simple shapes and bright colors communicate modern design. It blends well with the traditional decorations like the ceramic roof plates, the traditional ramen bowls and the traditional square containers for condiments. It all feels wonderfully Japanese where in they are up-to-date but they never forget their roots. The design language used are a mix of Modern and Tradition! As you can see from the pictures, the place isn't tight. It has ample room for customers and waiters to move around freely. The lights are bright and the acoustics inside are sound. It can get a little noisy but not to the point where it gets annoying. From your table you can see the kitchen and what happens inside. The steam is rising and the heads of the cooks moving energetically around as they cook your bowl of ramen. You hear them communicating with each other in Japanese cooking lingo. It is quite entertaining. The Japanese really have a knack for this. The Latest Ippudo Philippines Offering: the Miso Akamaru! Now, Ippudo's Ramen offerings are pretty straight forward. They have the Shiromaru Motoaji, the Akamaru Shinaji, the Karaka-Men, and recently, they introduced the Miso Akamaru. Now I know what you're thinking, What the hell is the difference between the the Akamaru Shinaji and the 'NEW' Miso Akamaru? We'll get to that in a little bit. 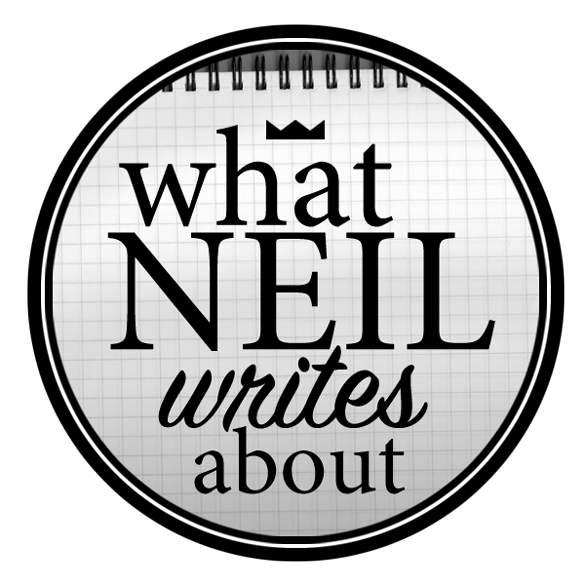 For now, let's talk about their offerings in general. As soon as you are taken to your seat, the waiter immediately takes your order. They explain each dish very well. They did their homework. I ordered the latest Miso Akamaru. I have been to this branch several times and have tried the rest of the Ramen dishes. I personally love the Shiromaru for it's herbal and earthy flavor that in itself is a balance of flavors. Not one flavor overpowers the other. This in effect is the more traditional style of ramen. The Akamaru on the other hand is the more modern style where in it has a refined flavor. 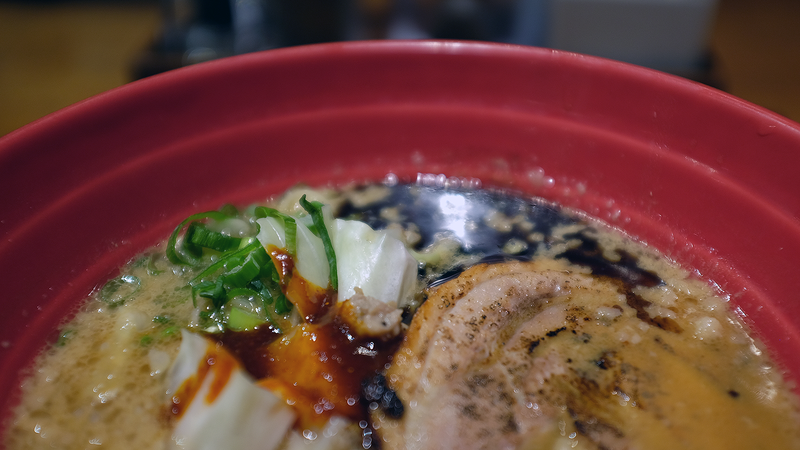 It has this hint of spiciness that brings out the other flavors from the tonkotsu broth, the pork loin, and garlic oil. The spiciness here is soft and never gets to the point of discomfort. The third offering, the Karaka-Men is different because of the spicy minced meat added to the soup. This blends well with the miso paste and garlic oils giving you that spicy 'kick' that some people can't get enough of. At first glance, you will notice that the Miso Akamaru has a Miso based broth and that there are added toppings like cabbage, minced meat and chopped garlic swimming in the soup. As you pull your noodles with the chopsticks you notice that they are thicker than the noodles in the other dishes. In fact, the waitress was kind enough to explain that you can only have it at medium hardness. Gyoza is best paired with Ramen! As you turn to the Pork loin (or Chashu), you see that it isn't steamed. It is torched individually and is the reason why this dish takes slightly longer to serve than the rest. As a result, you get this smokey, barbecue like flavor that perfectly contrasts the strong flavor of the miso broth and the lingering spiciness. Again, the spiciness never gets to the point of discomfort. I generally eat my ramen on its own but there are times where in you can have gyoza to mix it up. It's something I have if I find the broth too strong for my taste. I didn't do it for any of the Ippudo Ramen. 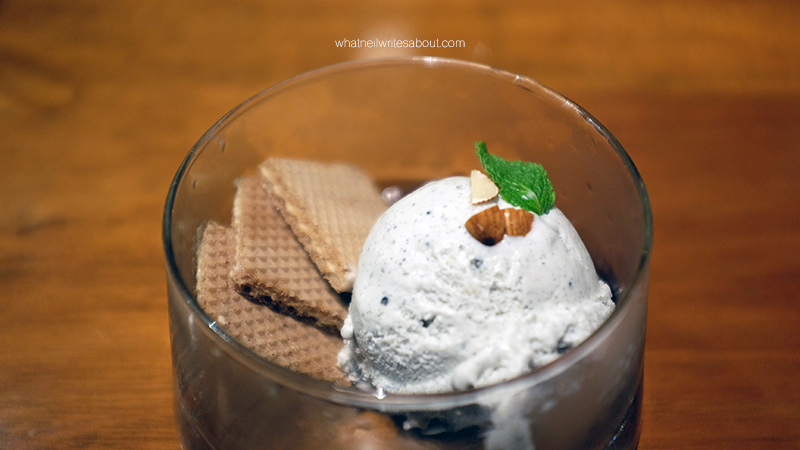 The Ice Cream is moist and creamy and you can really taste the black sesame as it touches the tip of your tongue! For dessert, I ordered their black sesame ice cream and I was pleasantly surprised. The ice cream is thick, moist and creamy. Moreover, you can really taste the black sesame as it touches the tip of your tongue. They add a spoonful of sweet bean paste that surprisingly tames the sweetness of the ice cream that is wonderful in your mouth. They also give you squares of chocolate wafers that serve to also contrast the sweetness of the frozen delight. I was amazed that it never got too sweet whenever I mix all three in my mouth. I keep wondering how they did it. After I had settled on my plush square dining chair, I was given their menu then I picked the Miso Akamaru and the Black Sesame Ice cream. A little under 10 minutes my Ramen arrived and It was somehow different from what I was accustomed to with the original Akamaru. I asked a waiter for the difference in the new dish. She was happy to satisfy my curiousity and even though I bombarded her with in-detail questions she remained enthusiastic. It brings a smile to your face when such wonderful service exists. They are keen to the little details like whenever my drinking glass would be less than half-full they would always refill it. I truly love their Ramen and their Service. 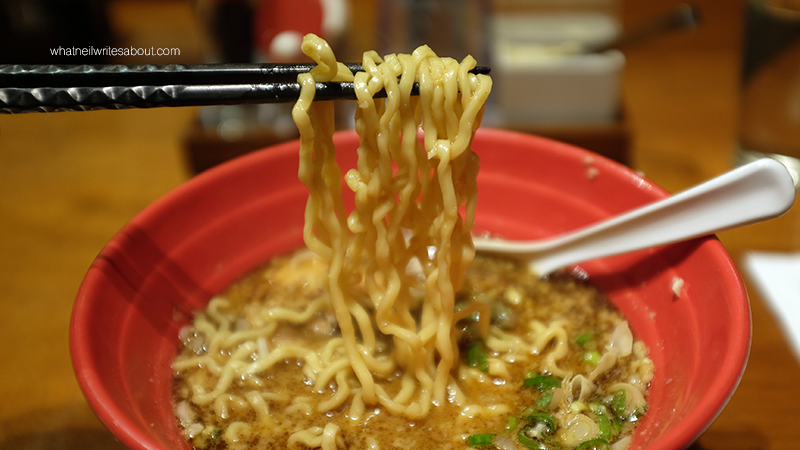 Ramen prices start at Php 375.00 and maxes out at Php 500.00. Now I consider this price good because remember we are using Japanese ingredients and when I compare this to the prices of the Ippudo Ramen I had in Tokyo, this is cheaper. 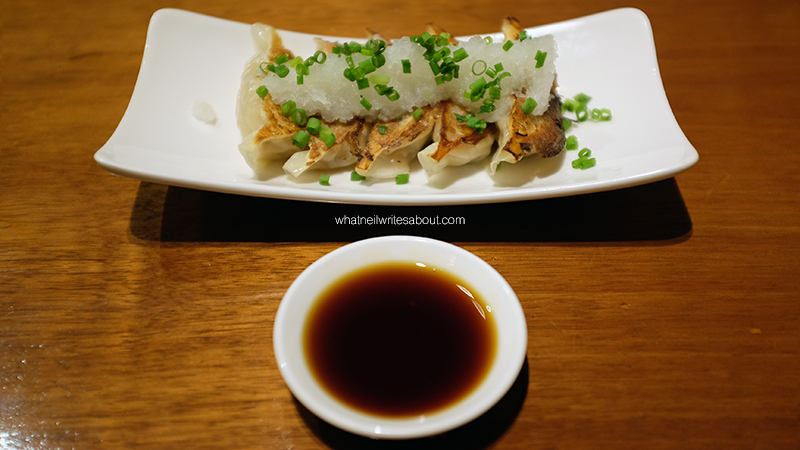 The rest of their menu like the gyoza and the ice cream starts at Php 50.00 and usually barely reaches Php 200.00. They also charge for their service. If I my memory serves me well, they charge the standard 10%.